This month we’re excited to bring you an array of new juicy releases, just in time for festival season! Outersect is Rob Rayle, a San Francisco Bay Area based audio technologist, composer and producer of genre-bending psychedelic electronic music that synergizes psychill, techno-bluegrass, and 70s progressive rock styles. Inspired by sights and sounds from around the world, Outersect fuses acoustic instruments and sounds with digital production to emerge with his own unique sonic experience. Outersect’s ‘one-man electronic jam band’ shows include live keyboard improvisation and sound loops to inspire ecstasy on the dance floor and auditory bliss. Outersect’s latest EP, Kinnari, was released in April 2018 on Bandcamp. His full-length albums include: Fenris Licks Your Hand (2016, Muti Records), God Love the Fool (2010, Beats and Pieces), and Caldera (2006, Heart’s Eye Records). We are proud supporters of Dissolv’s alluring World Bass vibes, and their latest ep, “Kintala” is no exception! Kintala transforms the Dissølv experience into a nomadic journey through bass music, featuring live violin & instrumentation from across the globe. By infusing entrancing elements of electronic synths with acoustic instrumentation, over a hypnotic bed of sub frequencies, this EP provides an eclectic twist to the global bass music scene. Reflecting its name, “Kintala” balances the vast polarities of the human experience, with primal pulses of heavy bass harmonizing with majestic melodies. 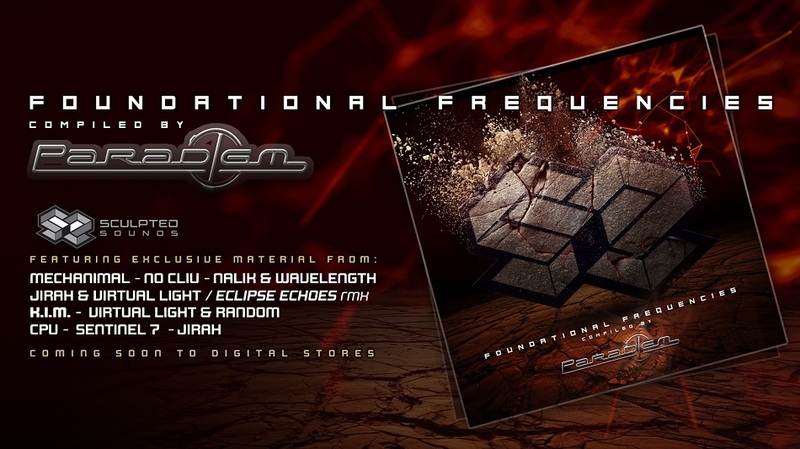 PARADIGM’S SCULPTED SOUNDS MUSIC LABEL TO LAUNCH ‘FOUNDATIONAL FREQUENCIES’! Sculpted Sounds is the modern evolution of an once proud and legendary event organization from 2010 in Denver, Colorado USA. Reborn today in California as a label during a time of unprecedented growth in the American trance scene, its mission is to raise the bar and quality of domestic and global talent connected to the California and larger USA trance community as a whole. Sculpted Sounds is comprised of the husband and wife team of Lawrence Chavoya and Bruna Amaral. Lawrence, also known as DJ Paradigm, is recognized as one of the longest standing core pillars of USA psychedelic trance. Bruna brings with her a business oriented sharp mind and attention to detail to balance the inner workings of the organization. They are supported by Chris Liu also known as No Cliu who is the label’s digital manager. With the ever growing popularity of Psychedelic Trance and Progressive in the United States there exists a gap in the labels represented. Sculpted Sounds goal is to fill this gap. To provide high quality, intelligent and dance floor oriented Full On, Progressive and Middle Groove that has parallel appeal to both the underground and mainstream. Our name is more than a name, it is our intent to expertly craft and sculpt psychedelic sounds for your pleasure. Our Keyframe Media Bundles are in! 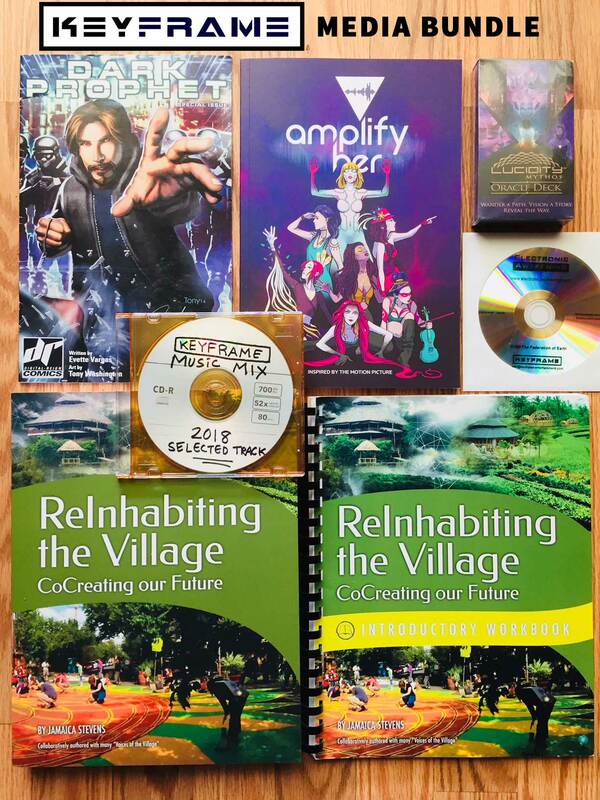 1 ReInhabiting the Village paperback book + 1 ReInhabiting the Village workbook + 1 Lucidity Mythos Oracle Card -deck + 1 Amplify Her Motion Comic book + 1 Electronic Awakening screening DVD + 1 Electronic Awakening sticker + 1 Keyframe music mix + 1 Dark Prophet comic book! Get this awesome rare package for only $99.99 + shipping—a 30% discount! Total merchandise value is $130+ ! Visit our store for this limited time offer!